To boldly go ever after? The search for habitable planets. Have you ever dreamed of exploring outer space? Of reaching up into the stars to venture where no person has gone before, exploring strange and exotic worlds all the while saving mankind from imminent destruction? From Star Wars to Battlestar Galactica the imaginative world of science fiction has painted a picture of the galaxy quite dissimilar from our own. 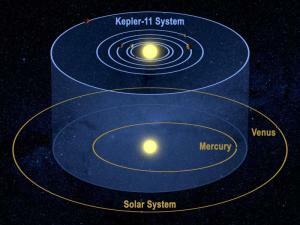 Theirs is a universe filled with habitable-world’s innumerable star systems surrounded by small rocky planets. While this makes for compelling story-lines, until recently it was thought that this view couldn’t be farther from the truth. Earlier this month it was released that NASA’s Kepler Mission, named in honour of German astronomer Johannes Kepler whose work laid the foundations for the laws of planetary motion, had discovered its first so-called Goldilock’s planets. A Goldilock’s planet is a terrestrial (rocky) planet of a similar size to Earth in an area known as the Circumstellar Habitable Zone. A system’s CHZ is a spherical region of space surrounding a star where a planet could theoretically possess the life’s essential element, water. In this zone, planets receive enough solar radiation to keep the bulk of the water above freeing, but not so much as to boil. In addition to being in the CHZ a Goldilock’s planet must also be within a region known as the Galactic Habitable Zone (GHZ). Along the same lines as the CHZ the GHZ is a region of the galaxy where it is thought that there is the highest possibility of finding habitable planets. It is far enough away from the galactic core as to not be severely affected by the high-energy radiation common there, but not too far as to be devoid of the heavier elements essential for the formation of terrestrial planets. 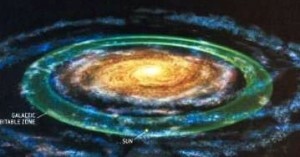 In the Milky Way this regions starts at around 25,000 lights years from the galactic core and extends to about 32, 000 ly. While the candidate planets discovered by the Kepler Mission will require careful follow-up to determine if they are indeed Earth-like planets, preliminary observations suggest that five of the fifty-four planet candidates in the CHZ are indeed terrestrial, and similar in size to our own. A new device from the Harvard-Smithsonian Centre for Astrophysics will likely play a key-role in verifying the characteristics of these new worlds. Knows as the High-Accuracy Radial velocity Planet Searcher or HARPS-North for short, the instrument soon to be installed in the Canary Islands will enable researchers to measure the tiny radial-velocity signal produced by small planets like the Earth. This data allows researchers to determine the densities of the target-planets enabling them to distinguish terrestrial worlds from their more common gas-based brethren. While these five planets represent a tiny fraction of the over 1200 planet-candidates found thus far during the analysis of over 150,000 star systems discovered by the Kepler Mission, that they were all located in such a minuscule fraction of the galaxy suggests that a universe of boundless habitable-worlds might not be too outside the realm of possibilities.